Cuba and the US will exchange ambassadors after the island nation is removed from the US list of state sponsors of terrorism, Cuban President Raul Castro has said. "This sort of unjust accusation is about to be lifted and we'll be able to name ambassadors," Castro said, as cited by AP. He was speaking to journalists on Tuesday at Havana’s international Airport after a visit by French President Francoise Hollande. In April, US President Barack Obama submitted documents to Congress that are legally required to officially remove Cuba from a list of states that sponsor terrorism. A 45-day waiting period is required to give Congress time to act on Obama’s decision by May 29. 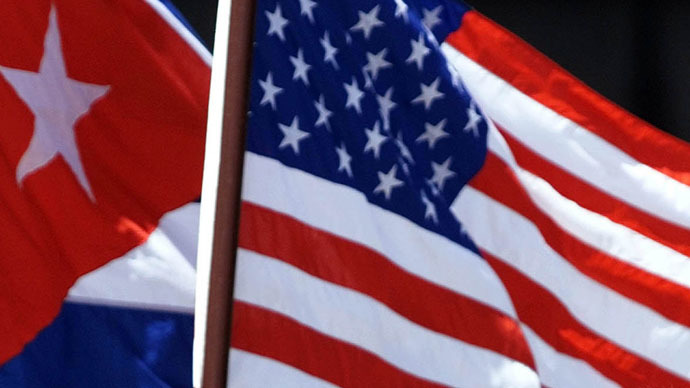 The US and Cuba have not shared diplomatic relations since 1961, although they have relied on lower level missions known as the Interests Section, which has been under the aegis of the Swiss government. Castro also said on Tuesday he had concerns over the activities of some American diplomats at the US Interests Section in Havana. The authorities in Cuba have long complained about contacts between US officials and dissidents on the island. Once diplomatic relations are restored the US trade embargo on Cuba remains in place, and only Congress can remove it. Castro insists this has to go, along with the base at Guantanamo. "They have to completely eliminate the blockade and the base at Guantanamo must be returned," Castro said, according to Reuters. "They give them I don't know how many classes, on screen, in teleconferences from the United States. I don't know if they give them a diploma and of course they give them their corresponding monthly payments," Castro said. The free classes in journalism, English and IT at the US Interests Section have always been regarded by Cuba as an attempt at meddling in its internal affairs.